The 11th hole at Latrobe Country Club Club. The WPGA is authorized by the United States Golf Association to use the USGA Course Rating System™ to perform course rating services in our jurisdiction. Both Member Clubs and non-member clubs are rated with approximately 30 courses completed each year. Course Rating services include hole-by-hole measurements for each hole. The golf course is then rated by a group of trained WPGA volunteers and staff, and after the ratings are computed the results are sent to our Course Rating Review Committee to review before each USGA Course Rating and Slope Rating® is issued to the golf club. We have started a practice of issuing ratings for each set of tees for both genders where appropriate. Each Course Rating™ is issued on the first business day of the month following completion of the services. There is no fee for Course Rating Services and course measuring services for WPGA Member Clubs. 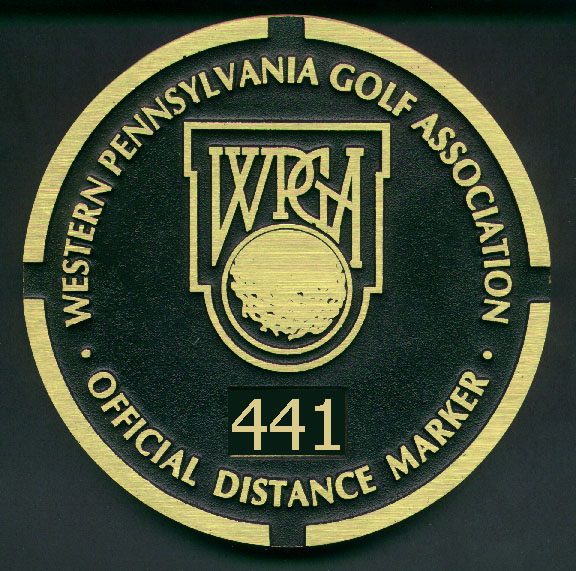 Included in these services for WPGA Member Clubs is one complimentary set of WPGA Official Distance Markers. The Association does charge a nominal fee to non-member clubs for these services. The Association's Course Rating Program comprises seven teams located throughout Western Pennsylvania and approximately 50 volunteers. The WPGA rates its Member Clubs on a six year rotating schedule or when changes have been made due to construction. Each golf club must have a USGA Course Rating and Slope Rating® issued at least every ten years to meet its requirements to the USGA Handicap System. If you would like more information on the Association's Course Rating Services please contact us by email or phone. For all current USGA Course Ratings and Slope Rating, please check the Course Rating and Slope Database™. For more information, please visit the Handicapping - FAQ or see below.